I came across these tearsheets in my stash the other day and wanted to share them with you. You could easily incorporate these elements into your own sewing, using Lisette patterns, to create similar styles for yourself. The little bow detail on the placket of this dress could easily be added to the Market Dress for a fresh, feminine look. And this cute bow could be added to the Passport Dress, with gathered panels at the side seams for a similar effect. You might want to move the zipper to the center back if you add the gathered panels, to reduce bulk at the side seams. This would be a great dress to wear to a wedding, wouldn’t it? 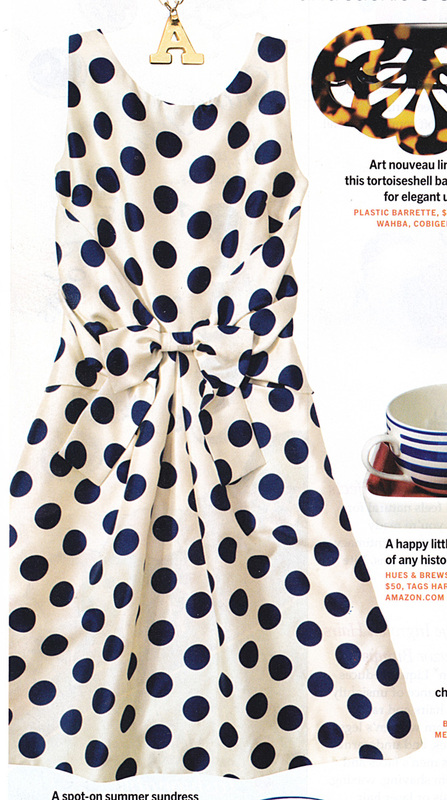 Really like the polka dot sash-now that would disguise a 5 child tummy!